WASHINGTON (CNS) — The chair of the U.S. bishops’ Committee on Domestic Justice and Human Development likes some of the provisions of the Senate’s tax bill, but those likes are dwarfed by items that he said run afoul of Catholic teaching. 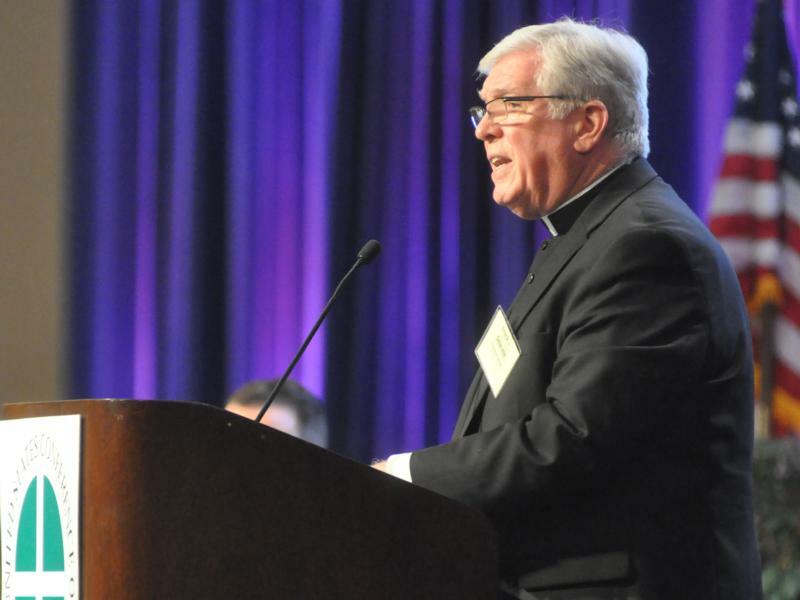 “The Senate proposal is fundamentally flawed as written and requires amendment,” said Bishop Frank J. Dewane of Venice, Florida, in a Nov. 22 letter addressed to senators, who are expected to take up consideration of the bill after they return from Thanksgiving recess. — “The bill eliminates multiple deductions for work expenses, such as deductions for union dues and expenses, work clothes and uniforms, and work-related education” he said. — With the repeal of the Affordable Care Act’s individual insurance mandate in the bill, “tax reform should not become the vehicle for a partial health care reform that fails to address significant problems in our health care system while exacerbating other difficulties,” Bishop Dewane said. — The Senate bill, like the House version passed earlier in November, “creates stricter rules around children’s Social Security numbers for the child tax credit, making it unjustly difficult for immigrant taxpayers to receive the benefit,” he noted. There were some items Bishop Dewane liked in the bill. “The above-the-line deduction for educator expenses was expanded from $250 to $500, and this is a praiseworthy change,” he said. “The Senate bill avoids some of the pitfalls of the House bill by not tampering with the adoption tax credit or the exclusion for employer adoption assistance programs, and by retaining the out-of-pocket medical expenses deduction, which is a lifeline for families facing serious and chronic illnesses,” Bishop Dewane added. Still other provisions brought mixed reviews. “It is also encouraging to see tax incentives for employers to provide paid family and medical leave, but this provision is scheduled to sunset at the end of 2019,” he added. I am a member of the working full time poor. This bill would remove all of my tax liability. Bishop Dewane cited all the wrongs that were in the new tax bill from a document that was prepared by a group of liberal social justice people who think this or that is the TEACHING of the Catholic Church. This misinterpretation of Church teaching has been recited so long by the Bishops that it has become truth in the Bishop’s minds. Misusing John XXIII ‘s teaching and not even attempting to use the social teachings of Pius XII and John Paul II. Dewane is using some sort of statistics and I remember John Cardinal O Hara saying that statistics don’t lie, but liars use statistics. But my question is why are Bishops worried about Congressional Tax Reform when the young sheep are living with each other in sin without the Sacrament Of Marriage. No one knows what Consubstantiation means – the real and true presence of Christ in the Eucharist. The Corporal and Spiritual works of mercy which supersedes what tax reform is about. The Teachings of Jesus about Love and forgiveness. I could go on and on about what the bishops are not doing in their role in the teaching the Magisterium of the Church. Bishops like our own were having meetings in London before Henry VIII broke from Rome. They were too weak to spiritually counteract the king worrying about secular things. Our Bishops think the are “relevant” worrying about social justice in a country that really tries to take care of the poor. I was for President Trump because he is against Abortion. I will do all I can to help the poor. I am going to try and help the homeless in my town.